The concept or birthstones being related to the month of birth developed closer to our times but, the idea of birthstones was conceptualized a few centuries ago. The historic breastplate worn by Aaron the Israeli High Priest, contained 12 stones. Each stone symbolized one of the 12 Israeli tribes. The idea of linking a gemstone to a person's zodiac sign then developed. This was later simplified and birthstones began to be designated for the 12 months of the year. A bracelet is a great way to wear a birthstone, most designs would incorporate more than one gemstone the birthstone could therefore be repeated all through the jewel. The month in which you were born will decide the gemstone to be used in your gold or 925 silver birthstone bracelet. The design of the jewel would be decided by you but, a few gem price logistics will need to be understood. Before we move ahead, let us list the birthstones for the 12 months, this will make it easier to understand the related concepts. The price of gemstones varies widely, for example sapphire the September birthstone can cost 100 or even more times the cost of red garnet, which is the January birthstone. Gemstones are priced per carat, the price moves up as the gem size increases. When working on a budget for a birthstone bracelet, keep the price of the birthstones in mind before, working on gem size and bracelet design. 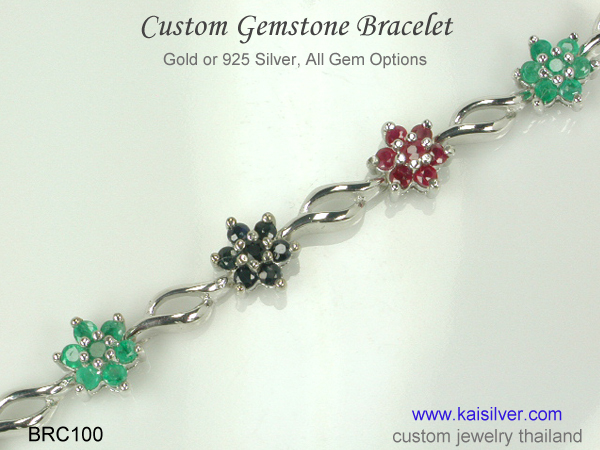 Refer to the ruby, sapphire and emerald bracelet on this page, the pretty flower motif is formed by a bunch of gems. More importantly observe that, the gems are not large mainly because, these three gemstones happen to be the most expensive gems to be used in jewelry. So should you choose a silver or gold birthstone bracelet. Just keep in mind that the choice of metal is entirely up to you, follow your preference and work within your budget. More important than metal choice, would be to ensure that the bracelet is constructed to be durable and well crafted. A sterling silver birthstone bracelet can be plated to make it look more expensive but, no plating done on silver will last forever. 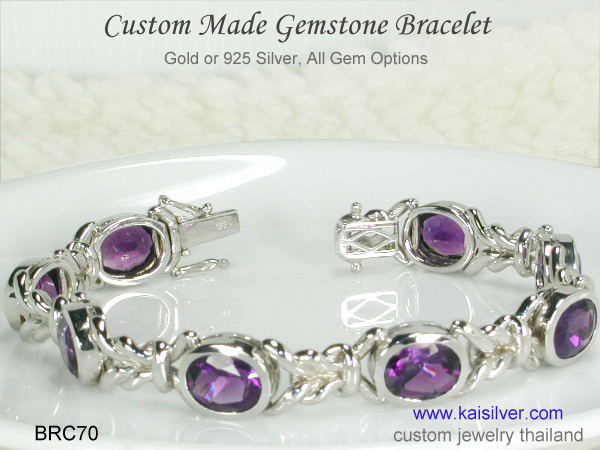 It might be a better idea to leave the sterling silver gemstone bracelet unplated. If you wish to go for a birthstone bracelet in gold, your choice would be 10k, 14k or 18k gold. You might be interested to know that, 10k gold is priced a bit lower than 14k gold and 18k gold is priced higher than 14k gold. In each of these gold alloys, you could select white, yellow or rose gold. 14k gold bracelets are very popular, but you can pick the gold alloy that suits you. Could you have something like a multi birthstone bracelet, what would be the significance of such a bracelet. To take an example, a man might want to gift a gemstone bracelet to his fiance (to be wife). While he could choose her birthstone for the bracelet, he could also alternate his and her birthstones all through the bracelet. In this case, the bracelet would have not one but two birthstones. Let us talk about another interesting possibility, a September birthday make a nice case study. A sapphire gemstone bracelet would make an awesome September birthstone jewel, it is often presumed that sapphires are always blue. Science has today proved beyond doubt that, sapphires are found in a range of colors including, white, pink, blue, green, orange and yellow. You could therefore wear a gorgeous sapphire birthstone bracelet that, showcases all or at least most of the colors that this gem is found in. Still on the topic of bracelets with many birthstones, her is an awesome concept. While this idea is not limited to a mother's bracelet, let us use it as an example. A bracelet with many birthstones could include the birthstone of all family members. A husband could gift such a gemstone bracelet to his wife, the mother of his children. The term used to describe such a bracelet is 'family birthstone bracelet'. When you get down to working on the exact birthstones to be incorporated in this jewel, the price factor of each of the birthstones require special attention. It is quite certain that, most of us would like to maintain the same gem size and shape for all the gems in the bracelet. This will be one situation where, choosing sterling silver for the metal will help you moderate the price for the bracelet. Custom Bracelet: You could choose a gemstone bracelet as a self purchase or as a gift for that very special person, in either case we would strongly recommend that you choose the custom made option. Ready made bracelets focus on attracting a broad base of buyers, compromise in metal weight and quality of gems is almost certain. Unlike a ring, pendant or earrings, a bracelet is a fairly large jewelry piece, multiple links and clasps are required features. Cutting on the gold or silver weight of your bracelet, means that the links are prone to falling apart and the clasp can break or open up easily. Sturdy prongs or an expertly done bezel setting are essential to provide a long lasting and secure gem mount. In a bid to keep costs down, most ready made bracelets give low importance to firm stone mounts. From improving digestion, to lowering cholesterol numbers and probably even preventing some types of cancers - brown or unpolished rice is gaining popularity across the world. 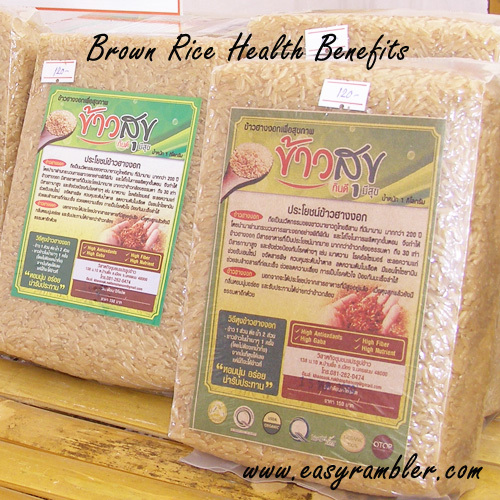 So what exactly is brown rice and why is it considered to be healthy, review this report ... more. Whole grains are awesome, incorporating them into your diet can give you a healthier heart. 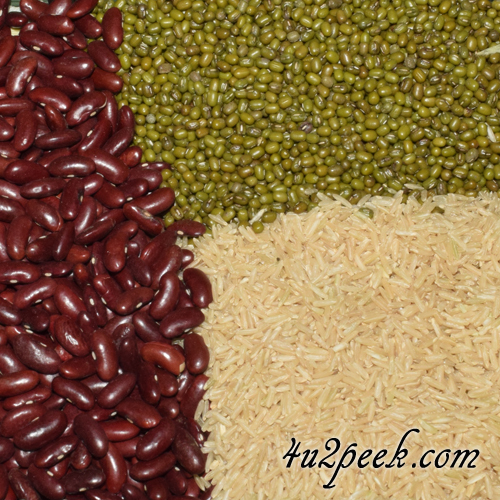 Many whole grains are known to have anti-inflammatory properties. Internal inflammations can result in very serious medical conditions. Whole grains are good for everyone, we tell you why ... more.